IT DOESN'T GET ANY BETTER THAN THIS FOR YOUR WELL-DESERVED VACATION . . . The cozy, casual atmosphere of Sea Trail is ideal for those discriminating guests searching for just the right combination of golf and beach in a warm weather community. Looking for a spectacular beach? Sunset Beach was ranked number 4 on National Geographic’s “21 BEST BEACHES IN THE WORLD!” (2017). * leave your linens at home! It's vacation time! * 58" Samsung High Definition 4K TV (wall mounted). Netflix friendly. * MOST SPACIOUS LAYOUT of all Champions Condos, 1450 sq ft , accommodating up to 8 guests, including larger porch with amazing view of the green. The feeling of spaciousness and relaxation hits you the moment you enter the condo! * convenient private Champions pool (including separate children's pool) only steps away from condo. * Champions Complex provides Sea Trail's upscale accommodations; the only units with own personal pool! * NO POOL ACCESS FEE FOR OUR GUESTS! * Our third floor location (top floor) is ideal with elevator access only steps away and no noise from overhead. * extremely well stocked kitchen with all the amenities of home ... Crock pot, Foreman grill, electric chopper, high end dishes and silverware, trays, storage containers, starter supplies, and more. The Resort is 2,000 acres and sports three, top-rated golf courses and a forth adjacent to the resort. Golf is all-year round, and the beach season runs from April until the end of October. Golf lessons and school are available with outstanding teaching professionals; the driving range and excellent practice facility are only a five-minute walk from the excellent, central location of our condo. Grab a couple of clubs and take a five-minute walk over to the range after dinner . . . no excuses not to improve your game at Sea Trail! Many of our guests have claimed the condo pictures do not do it justice . . . we've been told our Champions Condo is one of the most exquisite units on the Grand Strand! Please take a few moments to read some of our guests' terrific reviews! We promise that you will not be disappointed! Area cuisine is virtually unlimited with restaurants overlooking the Intercoastal Waterway only minutes away. If you don't want to go out, you can order in from the outstanding menu at the Magnolia restaurant, just a five-minute walk from the comfort of our condo. Over 40 excellent restaurants in Sunset Beach and nearby Calabash known as 'The Seafood Capital of the World'. 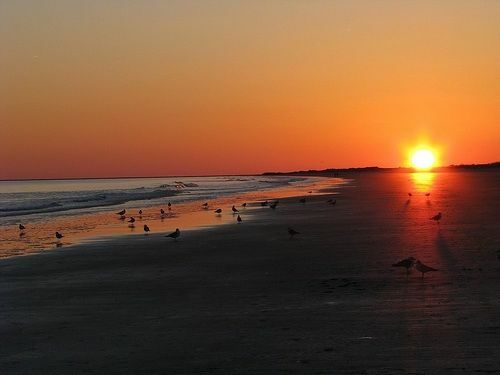 Well over 1000 restaurants in the Grand Strand area (within a one-hour drive)! This is an outstanding, reasonably priced rental opportunity. We look forward to hearing from you. See you on the 19th hole!!! My husband, three sons, and I all love a vacation filled with golf in the morning and lounging on the beach in the afternoon. Sea Trail has been a wonderful investment for us. We try to visit at least three or four times and year to enjoy this absolute slice of paradise. We loved Sea Trail the minute we saw it. The close proximity to the beach and the friendliness of the residents and staff make you feel so welcome. Our condo is centrally located within Sea Trail Resort and yet, it boasts a very tranquil setting. We are on a quiet cul-de-sac with a beautiful view of the Carolina pines dancing around the green of the 16th hole of the Byrd course. Our third floor location is ideal with elevator access and no noise at all coming from surrounding units. The view of the course is spectacular from our third floor vantage point. Elevator access. Very private cul-du-sac location with quiet, forested area bordering the green of the 16th hole. Free, super convenient parking is available. Starter supplies of shampoo, soap, toilet paper etc. Condo layout includes the Main Villa Suite (with two queen beds) and adjoining private Mini Suite (with two queen beds). Great for families & couples. Two coffee makers (drip version). 4-slice in villa; 2-slice in mini suite. Spices and some condiments, paper towels. Well-stocked cutlery drawers and every accessory you need, just like at home! in Villa section contains all stainless steel appliances including refrigerator, stove and oven, dishwasher, microwave, coffee maker, blender, garbage disposal etc. Second kitchen in mini suite duplicates all the amenities of the full kitchen (except for an oven). The mini suite kitchen offers a hot plate, full sized refrigerator, toaster, coffee maker, griddle, upgraded dishes, glassware and utensils. Great privacy for two couples travelling together, OR 4-6 golfers on a golf trip, OR for families wanting space to spread out!! 3 televisions. Villa living room has new 58" Smart TV wall mounted. There are three televisions (flat screens). Enhanced cable package with golf channel! Selection of books and magazines available. Lovely screened-in porch with rattan furniture and lounge chair overlooking the green of the 16th hole of the William Byrd course. Ceiling fan and exterior light allow for comfortable, late evening relaxation. Champions Pool is located only steps away from the condo. Kiddie pool also available beside the main pool. Nine foot ceilings, ceiling fans in all areas (six fans in total), second bedroom is a large mini suite with its own beautiful kitchen. Resort has numerous amenities for guests. Our condo has a $20,000 upgraded package with high end furnishings and state-of-the-art stainless steel appliances, Corian counters, maple cupboards, and professional designer decor. You will not be disappointed in this beautiful condo. Sunset Beach in only one mile away (biking there is an option). Three beautiful championship courses are located in the Sea Trail Resort. The driving range is only a 5-minute walk, so there will be no excuses for not improving your game! LOL. Love this place! 4th stay and just as good as ever! We love the unit, with all the comforts of home! I appreciate quality sheets and towel! Thank you for renting this lovely unit out! We will definitely be back! We totally enjoyed our visit. The villa was fantastic. Very close to the golf courses we played. Definitely would stay there again. Great location, plenty of room & very clean! We will definitely consider renting this unit again. Owners are very nice. The unit was well appointed, quiet. & a great location of course! We really enjoyed our stay. Well maintained property with all essentials. Plenty of room for everyone. Was nice to have the mini-suite for my son and his family. Short drive to ocean. The condo was beautiful and spacious..my sons were thrilled that they got their own space to sleep in, had their own bathroom and tv...unfortunately we had quite a bit of rain while there, but it was so much better being able to spread out here, rather than 4 of us being crammed in a hotel room. What a lovely place! All the comforts of home (and then some) in a beautifully furnished condo. Our favorite part was the deck with its peaceful and serene view of the golfers below. Just steps to a great pool and very close to fabulous Sunset Beach! We hope to return! Sea Trail offers an excellent Golf School or private lessons can also be arranged. Very reasonable rates! Just ask about lessons at the Pro Shop.